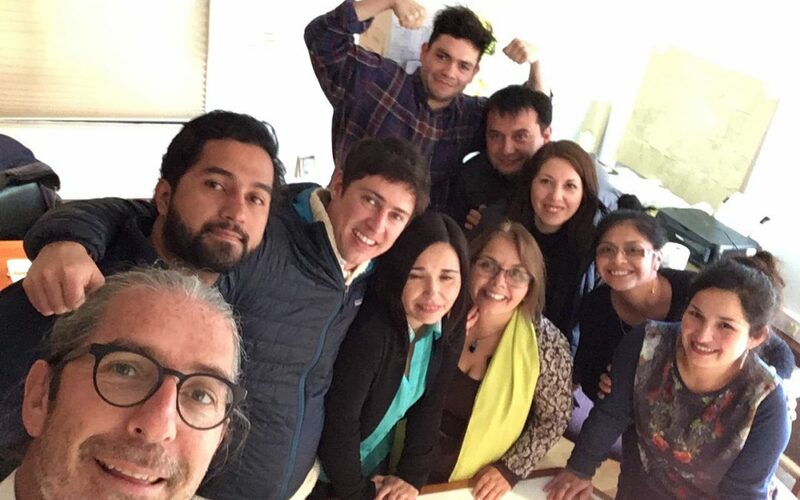 “One of the projects I work with since 2014 is the Center for Entrepreneurial Learning at Valdivia (south of Chile). The center is part of the faculty of economics at Universidad Austral. Last month we (the center as a group is currently 12 people) decided to rethink and re-feel our practices of collaboration and effectiveness due to the new projects that were assigned to the center. This became the driver that led us to the following proposal to: share some technologies that we were not exploring at the time regarding the amount of projects the center was currently leading: S3, some other agile and self-management tools, and some wholeness practices. Next we agreed to introduce consent as the way of making decisions inside each circle. Wehave used circles as part of self-organizing and self-management practices inside each project since 2015. We understood that this would need a deeper reflection inside the center, introducing a delegate circle for those decisions that would affect everyone for example. For some time, a number of the group, including the center´s director, had been experiencing and sensing a lack of motivation within the team. We started reframing our values, purpose and strategic objectives. It was wonderful to rediscover purpose, celebrate each other and gain motivation. Then we redefined projects as domains and described the primary drivers for each domain, along with describing the primary driver for the Center as a whole. The act of defining drivers was very interesting because in some domains we needed to translate some quite bureaucratic terminology into a language we together felt more comfortable with and could agree on together. Many insights (sub-drivers) arose from these first steps towards reinventing our way of organizing work and collaboration. One of these was to develop greater relational awareness. So we agreed first to have an “Emotional Backlog” (a pattern developed first in the Sociocracy 3.0 movement in Brazil), and to restore relationships inside a restorative circle. Going forwards we are developing operational and governance backlogs for each domain. And now, here we are, very inspired and looking forward to redefining roles and creating operational, governance and emotional meetings. People found S3 very cool and practical due to patterns that can be introduced one at a time or plugged together in clusters. The group found it wonderful to navigate via tension, to agree by consent and to remain in the awareness of working together, driven by values they felt a sense of ownership over. So one of my roles was defined and will be to introduce as many patterns as the group needs (and can handle). So there we go! I’m looking forward to share our next steps. Ronald is an academic at the University Andres Bello in Ecological Assessment for Real Estate Projects and Project Management. A professor at the Masters in Human Scale Development and Ecological Economics, Universidad Austral. He also serves as a process facilitator at the Center for Entrepreneurial Learning and consults internationally on participatory tools towards regeneration and organizational change.